Later in this tutorial, we’ll want to turn our model into an ad-hoc network and experiment with routing. To this end, we add three more wireless nodes, and reduce the communication range so that our two original hosts cannot reach one another directly. In later steps, we’ll set up routing and use the extra nodes as relays. We decrease the communication range of the radios of all hosts to 250 meters. This will make direct communication between hosts A and B impossible, because their distance is 400 meters. The recently added hosts are in the correct positions to relay data between hosts A and B, but routing is not yet configured. The result is that hosts A and B will not be able to communicate at all. 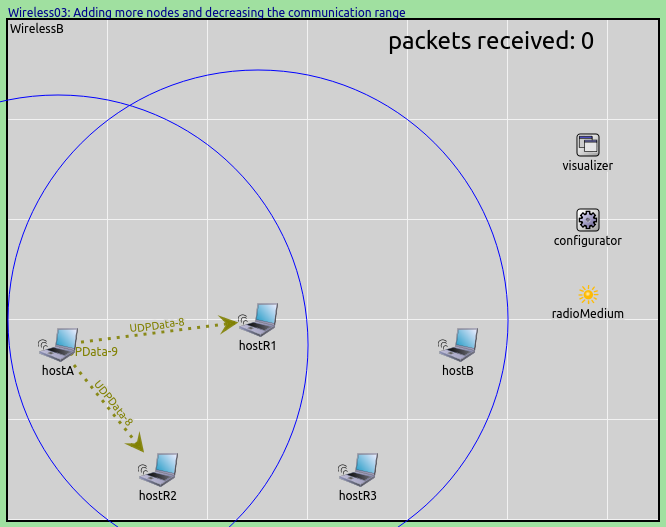 When we run the simulation, blue circles confirm that hosts R1 and R2 are the only hosts in the communication range of host A. Therefore they are the only ones that receive host A’s transmissions. This is indicated by the dotted arrows connecting host A to R1 and R2, respectively, representing recent successful receptions in the physical layer. Host B is in the transmission range of host R1, and R1 could potentially relay A’s packets, but it drops them, because routing is not configured yet (it will be configured in a later step). Therefore no packets are received by host B.